Hey, a variety of fasteners and washers! Limited quantities. Request your preference and I'll do my best; if your first choice is unavailable -- sorry -- I'll ship my 'standard' fasteners unless you request otherwise. If you want your choice or nothing, specify 'No Substitutions' and I'll refund the amount for the fasteners. 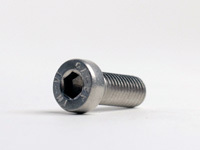 My 'standard' fasteners are the usual knurled stainless socket cap screws. I've changed my standard washer to a smaller O.D. because they look a little nicer. Here's the new offerings. 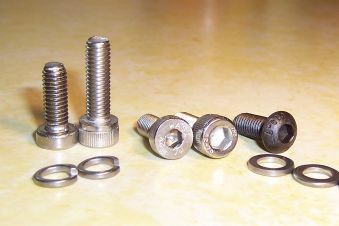 All the prices are the same as my standard fasteners and washers. Metric Button-Head Screws, grade 10.9 in dark flat finish, similar to black oxide. These are similar to O.E.M. used on later Suzukis (Bandits, GSXR, etc), and blend in with the darker engine colors. A more subtle look -- use when you don't want the screws to attract attention. Sorry, but I haven't been able to find any matching black washers. You can go without, or use any of my other washer styles. Metric Low-Head Screws in shiny A2 Stainless. The head height is 50% of the standard's and the socket is shallower. These have smooth (not knurled) heads. Still plenty of tool 'grab', but the screw head won't protude as much as standard cap screws. High-Collar Lock Washers (Split) in stainless. These are pretty cool, and are my new personal preference. A Hi-Collar washer is thicker and has a smaller outside diameter than a regular split lock washer. Performs comparably to a regular split lock washer as a greater thickness compensates for smaller outside diameter. Two of the original intake boot screws backed out on my '01 Bandit, which suggests that you might be better off with lockwashers on your installation.